Sometimes, the best route for entering code for Excel 2016 is the most direct one. Entering VBA code directly involves … well, entering the code directly. In other words, you type the code by using your keyboard. Entering and editing text in a VBA module works as you might expect. You can select, copy, cut, paste, and do other things to the text. Use the Tab key to indent some of the lines to make your code easier to read. Indenting isn’t necessary, but it’s a good habit to acquire. A single line of VBA code can be as long as you need it to be. However, you may want to use the line-continuation characters to break up lengthy lines of code. To continue a single line of code (also known as a statement) from one line to the next, end the first line with a space followed by an underscore (_). Then continue the statement on the next line. And don’t forget the space. An underscore character that’s not preceded by a space won’t do the job. The white-coated engineers who designed the VBE anticipated that people would be making mistakes. Therefore, the VBE has multiple levels of undo and redo. If you deleted a statement that you shouldn’t have, click the Undo button on the toolbar (or press Ctrl+Z) until the statement shows up again. After undoing, you can use the Redo button to perform the changes you’ve undone. Create a new workbook in Excel. Click the new workbook’s name in the Project window. Choose Insert → Module to insert a VBA module into the project. Position the cursor anywhere within the text you typed and press F5 to execute the procedure. F5 is a shortcut for the Run → Run Sub/UserForm command. 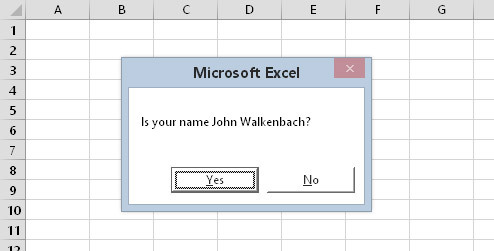 If you entered the code correctly, Excel executes the procedure, and you can respond to the simple dialog box. Remember, the text in the dialog box will be different. The GuessName procedure displays this dialog box. If you followed the previous steps, you just wrote a VBA Sub procedure, also known as a macro. When you press F5, Excel executes the code and follows the instructions. In other words, Excel evaluates each statement and does what you told it to do. (Don’t let this newfound power go to your head.) You can execute this macro any number of times — although it tends to lose its appeal after a few dozen times.